It’s the 2nd of April… That Has Nothing to Do With this Blog. 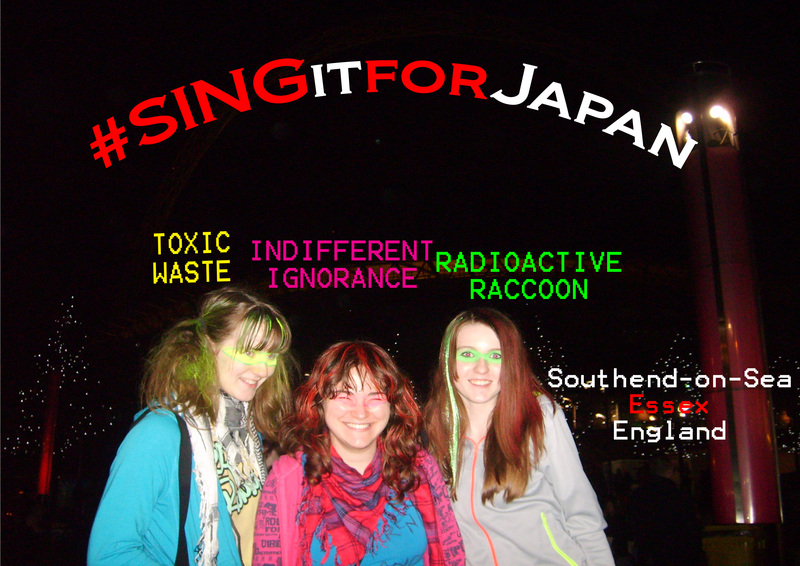 Some of you may be aware of a little project called #SINGItForJapan – if not, Ray Toro can explain, he’s the one behind it. Anyway, here is my contribution. Not very fancy, but I’ve only had Photoshop ten minutes. In other news, please vote for My Chem in MTV’s March Madness contest. You know the MCRmy are a better fan base than Paramore’s fans. I know it. It’s time to show the whole world it. Click and click and keep clicking, Killjoys! I only wrote that last sentence because of how cool it sounded in my head. On Thursday I was a reserve in the local Speak Out competition. Thankfully I wasn’t one of the three reserves chosen to speak in the final, but I did vote for the guy who eventually won to be in it. Love democracy. Anyway, check out the top three speeches here (I don’t know if they’re on YouTube). Some of the others, reserve and finalist ones, almost made me cry or fall off my chair laughing. One boy blamed everything bad about England on Fabio Capello, another had a thing or two to say about elderly people and another did a sketch on chewing gum, which sounds boring but really, really, wasn’t. It got me thinking: if I had got off my arse and remembered to write the entire speech, not just snippets in the staff room at work experience, I might have done quite well. In fact, I rather made everyone laugh with a rant on fangirls a few weeks ago. If I re-wrote and videoed them, and stuck them on YouTube, would anyone watch them? Hello, Work Experience. You Make My Feet Hurt. I Can’t Actually Remember What I Look Like Without Hair Product. I think ‘not very fancy’ is a bit of an understatement there. Also, how the hell is paramore winning? Did I miss the point when they became popular, because last thing I knew they were just something whiny eleven year olds trying to be emo, but not quite managing to make the grade listened to. Well, that sounded a bit harsh but there you go. They’re okay. I think they got the Twilight fans involved..? Oh, shut up. You missed all that.